The lists of names on these pages were compiled by the authors from a combination of the following sources - reports of the Inspectors of Mines, contemporary newspaper articles, FAI indexes and death certificates. Between 1852 and 1914, these are primarily sourced from the Annual Reports of the Inspector of Mines, with addition details from our own research. Pre-1852 and post-1914, the lists of accidents have been compiled primarily from newspaper articles. The lists on this site are far from complete, particularly for the years before 1852 and after 1914 but we are continually working to update these through our own research. Please check the lists carefully as many accidents are given under the date of accident, not death, or the date is recorded incorrectly. We aim to commemorate as many of those who lost their lives in mining accidents in Scotland as possible, however at the moment we are unable to accept any submissions. If you are looking for information on a Fife miner, we would highly recommend you also visit the excellent Fife Pits and Memorial Book. * We have recently obtained copies of reports, including names, by the Inspector of Mines for the years 1922-1924. Work is ongoing to transcribe these and they will be added to the site as soon as possible. These lists also contain names of deaths not listed in the Inspectors reports, identified from newspapers and other sources. After 1914 the Inspectors reports do not gives names of those killed or injured in accidents, apart from the years 1922-1924. We have compiled the information from a limited number of other years for the inspectors reports (currently 1925, 1926, 1927, 1929 and 1932) and included with the index for the relevant year. The information for all other years is compiled from newspaper reports, indexes of FAI, death certificates and other sources. Please note that from 1942 onwards we do not routinely put newspaper articles or other detailed information on the site. Before we obtained access to the registers of FAI, identification from newspapers and other sources was estimated based on a sample of 16 years between the years 1915 and 1938 for which we know the total Scottish fatalities as recorded by the official statistics of the Inspector of Mines. At that time the site contained approximately 74% of fatalities during those years (1738 of 2342 fatalities). For years where we have utilised the FAI registers (e.g. 1919, 1920, 1925), identification is almost 100%. Since we also include deaths by natural causes while at work, the total number of deaths may exceed those included in the official statistics. Work is ongoing to extend coverage from the registers of FAI and other sources. 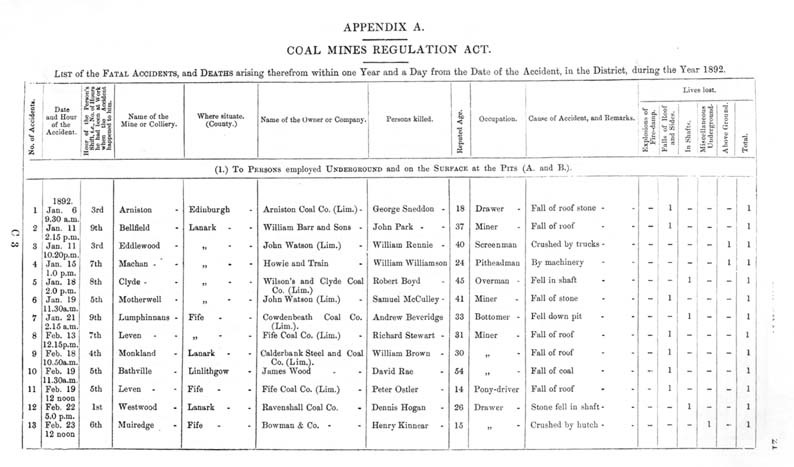 For some years, the Inspector's reports published names of miners involved in non-fatal accident, or prosecutions. These are gradually being transcribed and added to the site. Please note the lists are transcribed in the original format used by the inspectors but will be added to the general alphabetical indexes to aid searching. NB The above is not a comprehensive list of major accidents and disasters in Scottish pits - just the ones covered on this site. These indexes are no longer being updated. Please use the custom Google search to locate non-fatal accidents. The below indexes were set up as simple surname indexes for people listed on the site, including those involved in non-fatal accidents and rescuers but excluding known fatal accidents (see above). In general we did not include names of miner inspectors and owners in these indexes. Please note some of those listed in these indexes may have died as a result of the accident but we have not yet looked for a death certificate to confirm this.